Cowgirl up in this fringed frock from Tadashi Shoji. The Giovanni gown is the essence of country cool, with its crocheted lace and tiered skirt, while the lush bouquet from Summer Robbins creates a vibe that’s simultaneously loose and luxe. On him, a Brooks Brothers’ Milano suit and Milano gingham dress shirt bring in a bit of city-boy chic, while a bold pocket square from Kiriko polishes off the look. Buck bridal tradition in local designer Elizabeth Dye’s fun and flirty Valhalla gown. Its warm olive hue, tiers and tiers of tulle, and layered high-low skirt turn heads from all directions. Pair it with Lulu Dharma’s labradorite and circle moonstone spiral gemstone cuff bangle (luludharma.com) for a modern wedding day look. Shoes are model’s own. With its delicate lace bodice and airy train, the Marin gown from the Israel-based Flora design house adds an ethereal elegance to your wedding day. The groom will look picture perfect in Brooks Brothers’ Milano suit and Milano dress shirt, while a cheery bouquet by Summer Robbins Flowers brings it all into focus. Ditch the traditional black tux in favor of a slick brown suit for a look that’s effortlessly modern and chic. We love the rich Italian wool Jetsetter suit from Bonobos paired with a crisp Milano shirt, tie, and pocket square from Brooks Brothers. Mara Carrizo Scalise’s round band tells everyone he said "I do." Show off your best assets (aside from that glimmering personality, of course) in this silk stunner from A La Robe (from The Dress Theory in Seattle). The plunging backline brings drama to the big day, while shoulder-sweeping gold drop earrings (from Anthropologie) polish off the look. Say I do to the dramatic Furiosa tulle and taffeta skirt from Portland’s Elizabeth Dye. Paired with Dye’s lace Ariel top, it brings an unexpected edge to wedding day attire (who says the bride has to wear white?). Complete the look with Fay Andrada’s silver Tayeh earrings (from spartan-shop.com), and the black-diamond engagement ring from Allison Hall (allisonhalljewelry.com). Be the belle of the ball in Nektaria’s tulle ball gown (from Nadia S. Evening in Seattle). Paired with Madewell’s whisper cotton crewneck knotted at the waist, it’s the essence of both flirty and fun. Aesa gray and white pearl allium frost earrings, Mociun mini peak ring, and Aesa moonstone ring (all from spartan-shop.com). Bouquet and boutonniere by Summer Robbins Flowers. 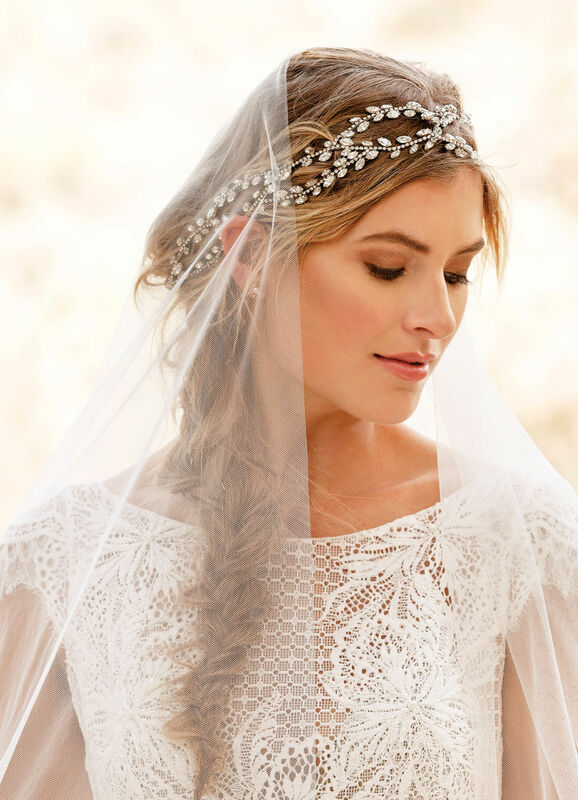 Go goddess glam with Elizabeth Dye’s ethereal English net veil pinned atop the sparkling crystal strands headpiece from Salem-based Twigs and Honey and the Aesa bronze and pink pearl stud earrings (from spartan-shop.com). The hair accessory’s entwined-vine motif is studded with dazzling Swarovski crystals and ties at the back to accommodate hairstyles of all sorts (bonus: the piece can even be worn around the waist as a sash). We love the look paired with the lacy boatneck and cap sleeves on Flora’s Julia dress (flora-bride.com for retailers). All eyes are on this silk stunner from Houghton (houghtonnyc.com for retailers). Allison Hall’s black-diamond engagement ring and Mara Carrizo Scalise’s Wave ring grace fingers on both hands, while the Aesa pearl drop earrings (from spartan-shop.com) offer a pop of glam against an easy updo. On him, Ted Baker’s button-down shirt (from Nordstrom) and a pocket square from Brooks Brothers bring a conspicuous contrast to Bonobos’ Capstone Italian wool tuxedo. Nestled among the wild juniper, panoramic bluffs, and open skies of Central Oregon’s high desert, Brasada Ranch’s sprawling estate is just the locale for a high-end, country-classic affair. Scenic ceremony locales dot the property’s 1,800 acres, while two separate reception spaces offer ample opportunity to create the wedding weekend of your dreams. Add to that a renowned golf course, sumptuous spa treatments, horse excursions, and guest accommodations that include both luxe lodge rooms and fully equipped cabins (complete with hot tubs!) and you and your crew will never want to leave.